Central Planning By The Fed is a Total Failure…END THE FED! The economy is not a machine, and the Fed is not a mechanic. Terms like an “overheating” economy,” and “stepping on the gas,” or “slamming on the brakes,” are all nonsense. The idea that that anyone is capable of “running the economy” is a pure fairy tale. 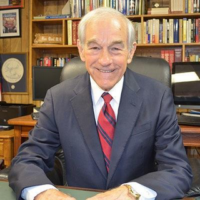 Ron Paul discusses this very popular myth.